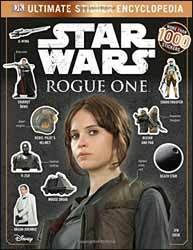 The Star Wars: Rogue One - The Ultimate Sticker Encyclopedia is pretty much exactly what it says. There are 30 pages of decent trivia text and pictures but the reason anyone is going to buy this is the 1000+ good quality stickers. So many stickers! I did an actual squeal of glee. I have no idea where they are all gonna go but somewhere, anywhere, EVERYWHERE! There are some spaces in the book itself to fill in Panini-style but I doubt much of that will go on. There are plenty of the main cast, the various ships and generic symbols, and the like, but even characters who made the briefest of appearances get at least one sticker. Well, two since there are also lots of dupes so you can share and not squabble over who gets the gonk-gonk droid... because there are four! They know their audience. Well worth the £7.99 asking price.